Some of the most important buildings of our time exist only on paper—and we're left to reconstruct them, over and over, in our imaginations. But that doesn't mean we can't experience these lost structures through other means. To honor El Lissitzky—the famously unbuilt German architect who inspired a generation of avant-garde designers in the 1920s—an architect named Guillaume Mazars has proposed a simple solution. First, build a framework of scaffolding. Then, rig the structure with programmable LEDs. Finally, use these lights to, in effect, create a giant, 3-dimensional TV set in the sky—upon which Mazars would recreate El Lissitzky's eternally unrealized "horizontal skyscrapers," also known as Wolkenbügel, or "cloud-irons:"
"By subtracting, in the manner of molding, we will reconstruct the spatial presence of the El Lissitzky project without physically reconstructing [the building]v itself," Mazars explains. As you might expect, his idea, too, is only a concept. 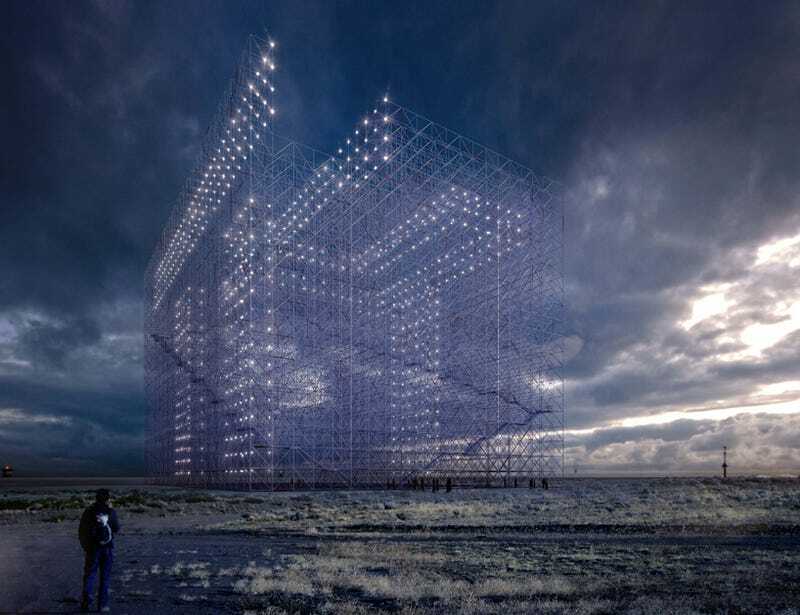 But the idea of reanimating lost architecture isn't as crazy as it seems. Sure, maybe it's through an Oculus Rift rather than a massive scaffolding superstructure—but imagine being able to walk through Ciudad Blanca, the legendary lost city just discovered in the rainforest, or the White City of Chicago's 1893 World's Fair. Or the original Penn Station.